A cruise can be a great vacation! But there are things to watch for. 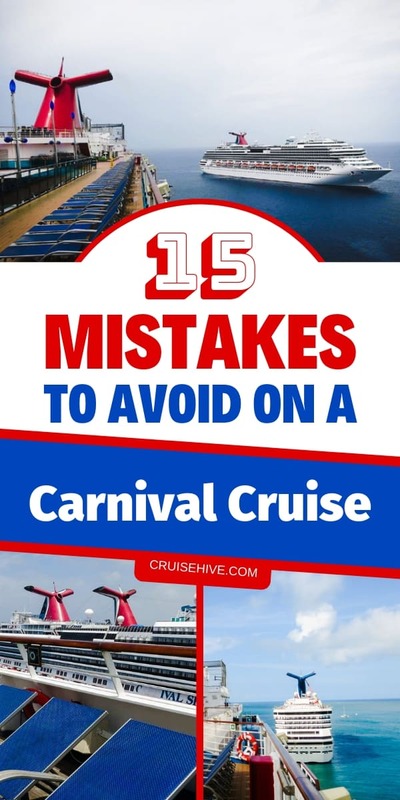 Here are 15 mistakes you should avoid on a Carnival cruise! When you’re planning a cruise vacation it’s essential that you do your research and spend adequate time planning, so you don’t end up making a rookie mistake that could ruin your trip. Although a cruise is an exciting experience, the planning portion can feel like a daunting task. Especially if you’re a first-timer. Whether you’re looking to take the kids on a fun cruise or you’re just looking to get away with your partner – a Carnival cruise is a great choice that’s chock full of breathtaking attractions for anybody. But when you’re vacationing on the world’s largest cruise line, you don’t want to stick out like a sore thumb because of an avoidable blunder. Keep reading to learn 15 mistakes you’ll want to avoid on a Carnival cruise. Some people assume Carnival cruise ships are all the same, but they actually can have unique activities choices, dining experiences, and other varying features. There are several other breathtaking options – these are just some of the most favored Carnival ships. This ship is the first in her class and has quickly become a state-of-the-art attraction – a wonderful choice for the whole family. There is even a sister ship named Carnival Horizon which offers even more! This Carribean cruise is not to be missed. It’s known for its lively atmosphere and its stunning cuisine options. Depending on your cell phone carrier, you may rack up hundreds of dollars in roaming fees, data charges, or ludicrous call-per-minute rates. If you want to avoid massive data roaming charges, which can be as much as $5 a minute on a cruise, turn your phone on airplane mode or turn it off when not in use. The Carnival ships also come with a wifi option, which starts at $5 USD daily and goes up to $25 USD per day. Still, this beats thousands of dollars in data roaming charges! On shore excursion days, it’s critical that you’re back on the ship on time, to avoid being left behind on shore. Although this isn’t common, it doesn’t mean it can’t happen. On shore excursions, you can either book activities through the ship, or you can plan your own day out on shore. Just make sure if you’re using your cell phone as a clock, you ensure it doesn’t reset to the port’s time. Always go by the ship’s time, to avoid the costly consequences of being left behind. On a Carnival cruise, you’re given several cabin options. Of course, better cabins come at higher prices, but they can be worth the extra fee depending on your needs. On a Carnival cruise, you’ll have scheduled times where the guests will be given information for the following day’s shore visit. This isn’t something you should skip. You can expect to be given crucial information like where to find certain amenities while you’re off the ship, what time you must return to board the ship, what you should avoid doing on a cruise port, and also information about the destination you’re visiting. You should also always read the ”Fun Times” daily newsletter while aboard any Carnival cruise, so you don’t miss out on dining times, scheduled activities, and more. As excited as you’ll be to get aboard the Carnival cruise, arriving early can actually delay the time it takes for you to get on the ship. The problem with this logic is everybody has the same idea. The earlier you are, the longer the line, and the longer you’ll have to wait. Plus, if you board the ship too early, you’ll be stuck with your luggage waiting for your cabin to be available. If you wait until most passengers are aboard, or about an hour before departure, it’ll be a breeze to fly right through security and on to the ship. If you’re an eager-beaver and don’t want to wait to get on board and in your stateroom, you can opt to purchase Carnival’s Faster to the Fun pass (FTTF). What Options Does the FTTF Pass Give You? Like arriving too early when you first begin your vacation, rushing for early embarkation can lag your departure from the ship – because everyone has the same idea. Carnival ships offer a program called Express Embark which is also called Self Assist, it allows you to leave early – when the ship is docked, if you carry off your own luggage. If you opt for this program, you’ll likely have an extremely long wait to get off the ship. But, if you decide to wait for the regular embarkation you’ll waltz right off the ship in no time. You may think this is the clique advice you hear from everybody when you’re about to go on any vacation – but when you’re on a Carnival cruise, this advice shouldn’t be taken lightly. What Will Overpacking Effect Anyways? You’ll likely come home with more than you brought, between souvenirs and items purchased on port stops. When aboard a Carnival cruise you’re given a room key, also known as a shipcard. But what you may not realize is your room key is also used for several other things. Just when you least expect it, you’ll require that card. But a common rookie mistake is not bringing it every time you leave your cabin. There are many things in life we can absolutely no control over. Flights are one of them. It’s always smart to fly in a day before your cruise departs, to give yourself sufficient time, so there’s no chance of missing your cruise. While the buffets on a Carnival cruise are delicious and convenient, you shouldn’t limit yourself to only eating at the buffet. The main dining room on any Carnival ship always has spectacular food, and it tends to be a bit better quality than the buffet. They also have specialty restaurants that you don’t want to miss out on, and 24-hour room service options. You’ll have to pay an extra fee to dine at one of the specialty restaurants, though. An extremely common mistake people make is assuming there won’t be any extra costs or fees. Unfortunately, it’s inaccurate in most cases. You do have extra costs that you should always plan and budget for. Even if you’re on an all-inclusive Carnival cruise. You cannot predict when unforeseen circumstances will arise, so investing in travel insurance for your cruise on a Carnival ship can be a worthwhile investment. Travel insurance for cruises vary drastically, so it’s vital to read the fine print. What Sorts of Things Can Carnival Cruise Insurance Cover? While most people know not to pack heavily on a cruise or any vacation in general, it’s also important to pack everything you need to avoid added expenses. It’s essential to pack for your trip accordingly, and not forget any of the essentials. You never know if you’ll be seasick or need an extra bathing suit. Although you can purchase almost anything you may need while on your cruise on the Carnival ship or on shore days, this can add up quickly and you never know what will be in stock. It’s your first day on the cruise, and you’re bursting with excitement. Who wouldn’t be? But try not to forget to relax during your cruise, as well. There are numerous activities to relax while aboard a Carnival cruise such as The Cloud 9 Spa, The Z Spa, Spa Carnival, and various fitness activities. If you’re running from one thing to the next without stopping to enjoy any of the activities, it can make for a stressful vacation. Instead, plan what activities, dining experiences, and shore excursions you’ll be doing for each day. As tempting as it may be to attempt to cram everything into one day, take the time to smell the ocean air. Getting prepared for a cruise can be incredibly stressful if you let it. If it’s your first cruise, it’s incredibly easy to make costly mistakes. Carnival cruises are known for their fun and easy-going atmosphere. So instead of getting overwhelmed, plan your trip well in advance and do your research so your time at sea is more enjoyable.